There is no end to the variety of species and individuals that can be found if one travels far enough from home. Throughout the various sectors of the Galactic Empire and beyond, potential allies and enemies can be encountered around every corner. 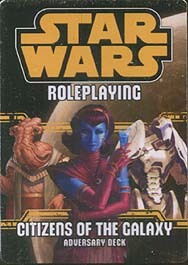 This deck requires the Edge of the Empire, Age of Rebellion, or Force and Destiny Core Rulebook and includes cards for 20 adversaries that can be encountered in every corner of the galaxy.